We've all got that memory (if only ancestral) of those low-budget 16mm educational films produced by the Encyclopedia Britannica, you know, with people in costume as say, Ben Franklin, on a chintzy set with kite, a key and lightning, while the narrator drones on and on. That sort of thing gave documentary “re-enactments” a bad name. Yet that nonfiction-cinema technique has been coming back – especially, I would guess, in material where no vintage footage exists or one doesn’t have the wherewithal of a Ken Burns to secure it. And these aren’t cheapo classroom re-enactments either, but ornate, expensive, period-dress stuff, to let you know that the filmmakers mean business. The only taboo that I can see, is that the tableau-vivant actors aren’t heard speaking scripted lines. There’s still a voice-of-God narrator or a chorus of “witness” voices to remind you that you are indeed in the docu-genre. Case in point: writer-director Josh Aronson’s ORCHESTRA OF EXILES, which is a partial bio of violinist Bronislaw Huberman (1882-1947) and partially the SCHINDLER’S LIST meets FITZCARRALDO meets I dunno, THE WALTZ KING or something out of old Hollywood, about how classical music first came to the territory that would later be known as Israel. Huberman was a major player in this, in more ways than one. A Polish-born violin prodigy, Huberman grew up shepherded by his father into a music career, in which he was so submerged, we are told, that it took World War One (and his controlling father’s demise) to finally realize there was stuff in the world than touring and performing. Belatedly attending college at the Sorbonne, he noted with alarm the anti-Semitism going along with the rise of Hitler. While other Jewish musicians, assuming that Nazism was just a passing hysteria, attempted to hold on to their illustrious careers and lofty positions by laying low - or throwing in with an ethnically segregated orchestra the Reich only permitted to perform for Jews – Huberman refused to perform on German soil. He became a passionate Zionist, relocated briefly to Austria, and sought to defy the rising tide of Holocaust by forming the New Palestine Orchestra in the Middle East. An early opponent of Huberman’s in this last exercise was, ironically, David Ben-Gurion, who was bent on building a Jewish state with immigrant workers, farmers and soldiers - not fickle orchestra musicians who might leave once the heat was off. 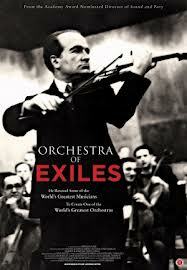 At its best ORCHESTRA OF EXILES gives us both the classical-music gossip and the intrigue, as Huberman manipulated the Third Reich's obsession over international respect for high culture to finesse immigration papers out of German authorities, allowing a number of endangered Jewish musicians and their families passage to British-Colonial Palestine during the 1930s. And there’s great dish about the formation of a European-style orchestra in a sparsely settled desert climate, for a historic inaugural performance under maestro Arturo Toscanini (another anti-fascist). When there aren’t re-enactment scenes (with actor Thomas Kornmann as the adult Huberman) there are interview snippets from the likes of Itzhak Perlman, Zubin Mehta, Joshua Bell, retired Israeli virtuosos and working present-day descendants of New Palestine Orchestra alumni. Still, I got a sense that only select bits of the story are being told, putting the emphasis on the music more so than Huberman’s own life, in which there are a few holes and unanswered questions. We learn that in raising funds for his New Palestine project, Huberman visited Carnegie Hall in New York City, and his prized Stradivarius violin was, straightaway, stolen (and this before eBay, or crack). The legendary fiddle resurfaced 50 years later and is now played by Joshua Bell. That’s amazing…so where had the instrument been all that time? Unless the Gestapo were involved, it’s probably a distracting sidelight that filmmaker Aronson thought disposable, but let’s face it, inquiring minds want to know. And, as this is very much a story of the triumph of Jews over their would-be exterminators, there is only a passing mention (probably lucky to have even that) of the uncomfortable fact that a number of Palestinian Arabs weren’t all that pleased with Zionism, and some bad feeling persists to this day. Yes, maybe off topic But as we’re told that Huberman was especially outraged at the silence of the world community at persecution of European Jewry, it occurs to me that aggrieved Arabs might respond with something like “So what are we, chopped liver?” or the Muslim equivalent. Just saying.